Tsar Boris III from Bulgaria (left) with officers of his army. Throughout World War II Tsarist Bulgaria was only officially at war with England and America. Her alliance with Germany was due in part to their common experiences during World War I, the hope of territorial gains, and her distrust of Soviet intentions. Following the Balkan Campaign during which German troops were allowed to traverse Bulgaria, she was allowed to occupy Greek Macedonia, Thrace and Salonika, a huge territory of some 50,000 square kilometres. The principal task of the Bulgarian Army between 1941 and 1944 was the garrisoning of the new territories, where often side-by-side with other Axis forces it waged a relentless war on partisans. In the summer of 1944, the Bulgarian Army disposed of over 21 infantry and two cavalry divisions as well as two frontier brigades. Seven divisions in two army corps were under German operational control in Western Macedonia and Serbia for the protection of the main German supply arteries between Belgrade and Greece. All but 10 of the divisions were basically obsolete, horse-drawn and lacking in both modern armoured fighting vehicles and anti-tank guns. 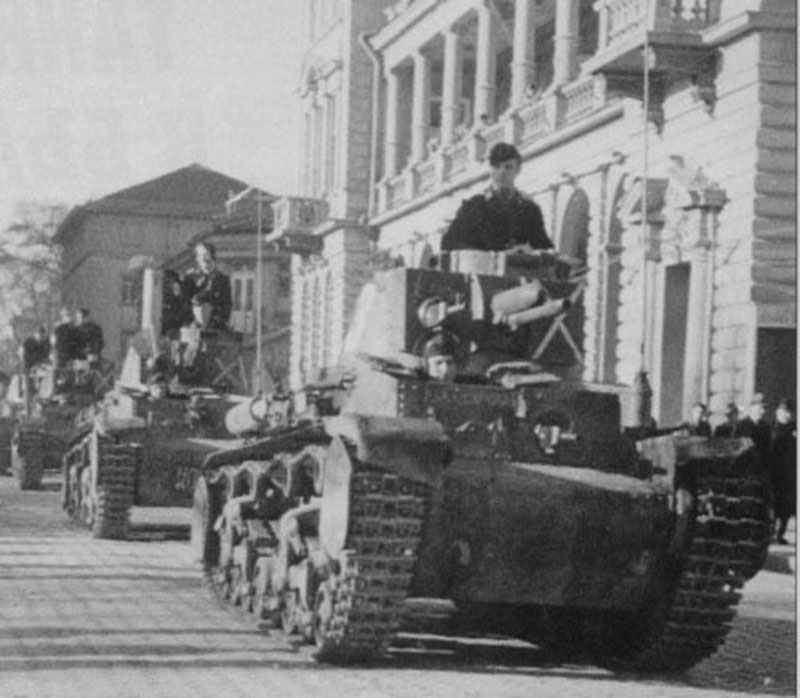 The armoured brigade was equipped with 60 German armoured fighting vehicles (PzKpfw 38(t), PzKpfw IV), while in the whole Bulgarian Army there were only 121 tanks (including French Renault R-35). Bulgarian paratroopers in Macedonia, 1943. 5 Army at Skopje, Macedonia South-East Serbia 50 Infantry Regiment of 1 Infantry Division (at Pirot)"
52 Infantry Regiment of 14 Infantry Division (at Vranje)"
Bulgarian Skoda LT-35 tanks (= PzKpfw 38(t) ) in September 1944. At the end of August 1944, as a Soviet army group was approaching the Bulgarian frontier, the Tsar, Boris III, who was a loyal ally to Germany, died under mysterious circumstances one year before. 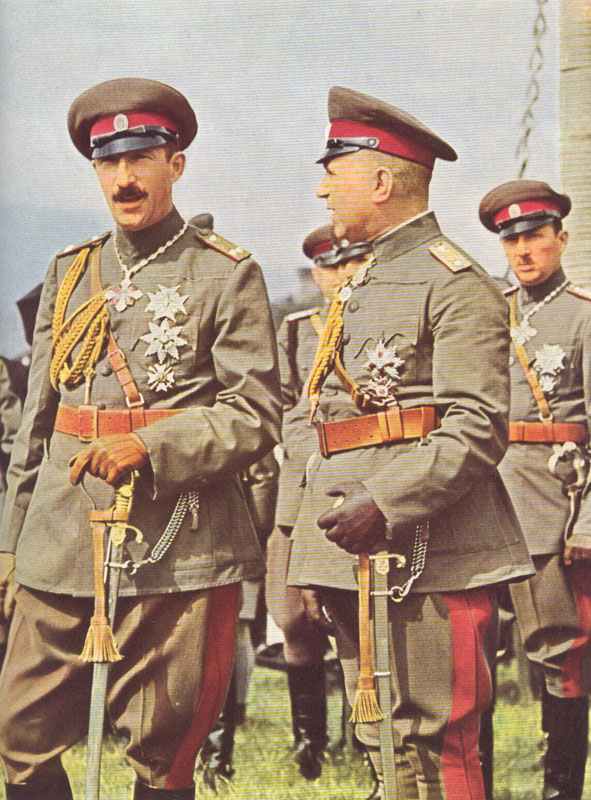 On 9 September a coup d’etat took place, and the new Government of the Fatherland Front made peace with the Allies and changed sides. The armed forces were purged of their most reactionary officers, political officers (commissars) were appointed, and overnight Royal Guard Regiments became People’s Liberation Brigades. I armoured brigade; 1 independent brigade. Now the task of the 1st, 2nd and 4th Bulgarian Armies with Soviet air support and under Soviet operational control, was to prevent the Germans from retreating from Greece and the Aegean. The fighting was by no means over and the fighting was hard. Relations between former enemies were often strained, while the changing of sides and uncertainty about the future affected morale. 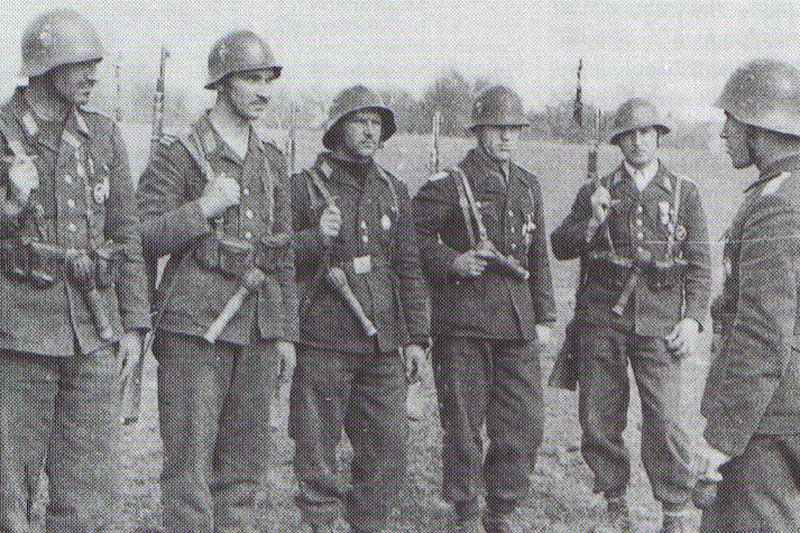 May 1945 found the Bulgarian Army on Austrian soil, where on 13 May they linked up with British troops. Between September 1944 and May 1945 the Bulgarians lost 31,910 killed, wounded and missing. from Germany delivered ex-French Dewoitine D520 fighters of the Bulgarian Air Force in the winter 1943-44. After World War I the treaty of Neuilly (1919) banned military aviation in Bulgaria, but this prohibition was circumvented. In the mid-1930s the Bulgarian Air Force was built up with Italian and German aid and the provisions of the 1919 treaty were openly repudiated in 1938. In the following year Poland supplied fighter and attack aircraft to Bulgaria and by September 1939 her Air Force comprised eight air regiments (130 planes, of wich were approx. 40 PLZ P.43 Karas three-seat reconnaissance bombers). The outbreak of war cut off Polish supplies and, as the Italians had been ousted by their Axis partners, the way was open for German penetration of the Bulgarian Air Force. A Bulgarian mission to German-occupied Czechoslovakia bought a substantial number of former Czech Air Force warplanes, including 72 Avia B-534 biplane fighters and 32 Avia B-71 bombers (Czech-built Tupolev SB-2s). Luftwaffe advisors were dispatched to Bulgaria in 1940 and German training and liaison aircraft were supplied, together with 10 Messerschmitt Bf 109E fighters and 11 Dornier Do 17M bombers. Despite this infusion of new equipment, morale in the Air Force was low. The presence of German advisors was resented and the mass of the population was pro-Russian, only the Royalist party favouring friendship with Germany. Nevertheless, in March 1941 Bulgaria signed the Axis Pact and Luftwaffe units moved into the country in preparation for the assault on Yugoslavia and Greece. The Luftwaffe mission in Sofia aimed to bring the Bulgarian Air Force into line with German operational standards, so that it could be entrusted with its own national air defence. However, the Bulgarians firmly resisted all attempts to involve them in the war with Russia and as a result few German warplanes were supplied to her in 1941-42. Bulgarian Messerschmitt Bf 109 G.
The threat to the Romanian oilfields from American strategic bombers changed the picture and in 1943 German supplies resumed. Yet the first large-scale USAAF raid on Ploesti (1 August 1943) found the Bulgarians woefully unprepared. Only three B-24s fell to their guns, out of a total of 54 American bombers lost. 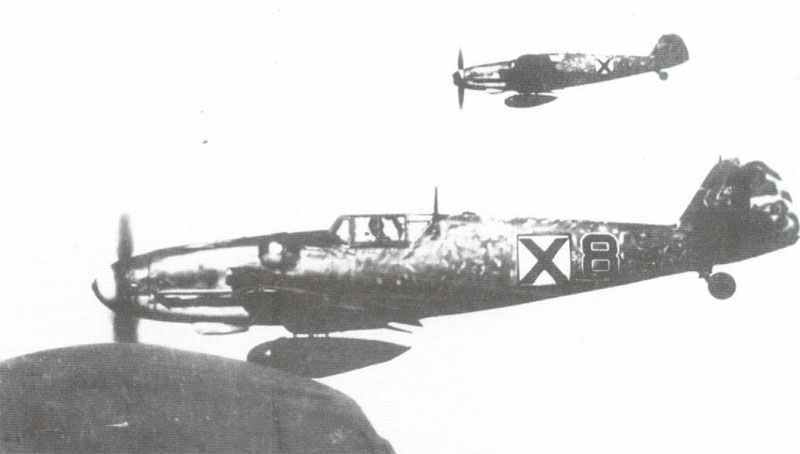 The Bulgarian Air Force was further strengthened by the supply of 100 French Dewoitine D 520 fighters and 48 Bf109Gs (see picture left) were promised by Germany. Even so, the Bulgarians had little success against escorted American raids between November 1943 and January 1944. By September of the latter year, the hostile Soviet forces were on Bulgarian soil. Many Bulgarians surrendered or joined the partisans and on 9 September Bulgaria declared war on Germany. Thereafter, her Air Force fought alongside Soviet air regiments. Based at Varna on the Black Sea, in 1939 the Bulgarian Navy comprised four ageing destroyers and torpedo boats, five motor torpedo-boats of S-boat design and six rivercraft. In addition, she possessed 14 merchant ships; naval air support was supplied by Army seaplanes.After declaring for the Axis in 1941, Bulgaria is thought to have purchased six more motor torpedo-boats from Germany. These had been captured when incomplete near Rotterdam, and moved across Europe. Their service and fate is uncertain: some may have remained in German service in the Adriatic, while others may have been repossessed after Bulgaria’s enforced change of sides.